There are so many exciting games coming up and such little time. So as an early gift, the Franchise is here to break down why the Clippers lost to the Nuggets, as well as preview every game until Christmas. Enjoy! Los Angeles needs to survive this scary stretch in order to keep up in an insanely competitive Western Conference, which is why the loss to the Nuggets really hurt. Going into Denver is usually a nightmare with the high altitude and exhausting conditions. Just two years ago, the Nuggets were a league best 38-3 at home. However, they are off to just a 6-6 start at the Pepsi Center this year, and it was a key opportunity for the Clippers to begin things on a positive note. The Clippers opened the game with little energy and settled for jumpers. Denver packed the paint and doubled Blake whenever he had decent position. This opened up good looks, but the Clippers could not buy a bucket. They were just 2-16 from outside the paint, and it led to a lot of easy buckets for the Nuggets in transition. Denver took a 16-point lead into the half shooting 59% while holding Los Angeles to just 35%. However, the Clippers regrouped and locked down defensively in the third quarter, holding the Nuggets to just 15% shooting from the field. The Clips were playing extremely hard and making all the right rotations on D. Stops led to easy buckets, and they found a groove offensively. This resulted in their best third quarter of the year, outscoring the Nuggets 31-12. The Clippers would go into the 4th with a 3-point lead, but with Hawes injured, the bench struggled mightily. Doc was hoping for four to five solid minutes from Farmar, Jamal, CDR, Baby and DJ, but they got zero. The Nuggets’ bench jumped on the Clippers and opened the final quarter with a 9-0 run in just two and a half minutes. The Clippers’ bench needs to find a way to be competitive if they want to survive this next week of games. Hawes is a huge part of the second unit, but they let up an 11-0 run to start the second on top of the run in the fourth. This forced the starters to return earlier than usual, and as a result, Blake, CP3, and DJ all played around 40 minutes. After a few bad calls and a hard foul, the Clippers found themselves down 11 with 8 minutes to play. They lost their composure and got four technicals and a flagrant foul in the first four minutes of the final frame, three of which came from the bench (Barnes, Doc, Hedo). The six penalty shots proved to be the difference in the game, and the Clippers need to do a better job of keeping their cool when faced with adversity. They were playing so well defensively and have to know that a few bad calls are not going to determine the outcome of the game. Even with Jabari Parker out for the season, the Milwaukee Bucks will be a tough out for the Clippers. In their first meeting, the Clips lost despite Matt Barnes and J.J. Redick combining for 51 points. A big factor in the game was the length and athleticism of Giannis Antetokounmpo. He abused our smaller wings like Jamal Crawford by immediately posting up or driving to the hoop. His movement off the ball and ability to run the floor in transition also led to many easy buckets, especially when DeAndre Jordan wasn’t around to protect the rim. However, the key matchup in this game will be at the point guard position. Last time out, Brandon Knight stood toe to toe with Chris Paul and ended up winning the battle. While CP3 was clearly off his game, Knight played tough D and was a big reason Paul turned the ball over a season high six times and shot just 5-15 from the field. On the other end, Knight scored 22 points and took care of the ball (just 1 turnover). With under a minute left, he sank a devastating three and iced the game with free throws. With that being said, I expect Paul to rebound and win the position battle. He’s too consistent and smart to lay two duds in a row against the same team. On a side note, the Bucks really clogged the paint and suffocated every passing lane for Blake Griffin last week. When he did get the ball on the block, the D swarmed him with double teams, which explains why Griffin had season lows in both points (10) and field goal attempts (12). It’ll be interesting to see if the Bucks are able to take the ball out of his hands again. The Spurs have never been a good matchup for the Clippers. Last year, the season series was a 2-1 split in favor of San Antonio despite two of the three games being played in Los Angeles. In their first meeting earlier this season, the Spurs squeezed out yet another W. They shot a paltry 39.8% from the field and made just 2 of their 19 three-point attempts, but played stellar defense and repeatedly got to the free throw line in the fourth quarter. The biggest difference maker in this game was undoubtedly Kawhi Leonard. It was clear he had the hot hand, and Popovich kept running plays for him. Kawhi torched the Clips for 26 points to go along with his 10 rebounds. Defensively, he locked down his man on the perimeter and ended up with a block and three steals, the last of which occurred with under a minute remaining and the Spurs leading by 3. However, it was recently discovered that Leonard has torn a ligament in his hand. The Spurs expect him back in the lineup soon, but regardless of whether he suits up against the Clippers or not, this going to be a tough game. Even if Duncan, Ginobili, or Parker sit as well, the Spurs have repeatedly demonstrated that all twelve players on the roster can contribute. Players like Danny Green, Cory Joseph, Boris Diaw, and Aron Baynes have shown they can be counted on. Plus, Tiago Splitter returned from injury about a week ago, adding to their depth. This is going to be a tough game, especially considering it’s in San Antonio. The Clippers, who are struggling on the road (lost last 3 games), also have to travel to a blazing hot Atlanta team that’s 11-2 at home. The Hawks are built similarly to the Clippers in that they both have great point guards and big men surrounded by sharpshooters. I’d say the Clippers’ Big Three has an advantage over the Hawks’ combo of Teague, Horford and Millsap, but Atlanta has the more consistent shooters. The similar personnel groups have the Clippers and Hawks playing identically. 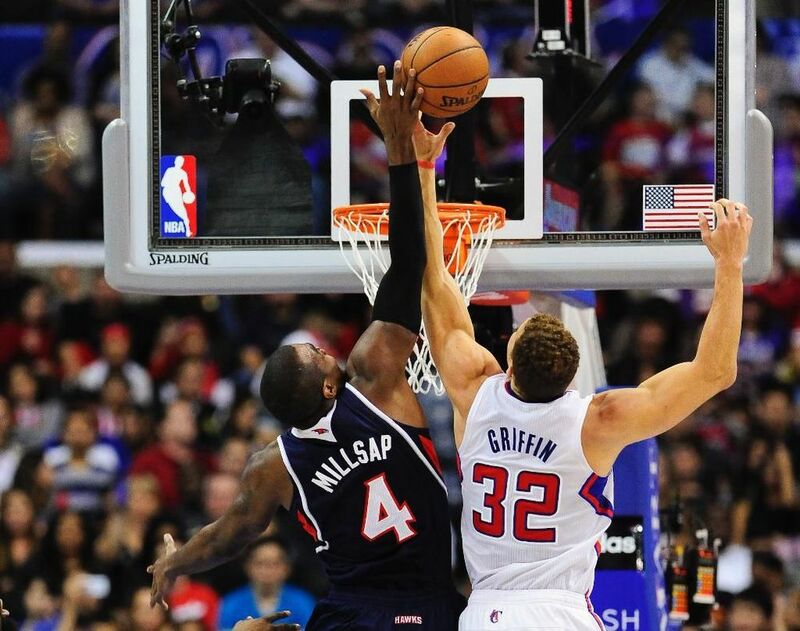 On offense, they both move the ball well; the Hawks and Clippers rank second and fifth in assists respectively. Both teams also rely heavily on three pointers, but with good reason. The Hawks shoot 37.8% from deep (fourth best in the NBA) thanks to Kyle Korver, who is the league’s best catch-and-shooter (54% on three-pointers this year). Likewise, the Clips are actually third in the league from downtown, shooting an impressive 38.0% from three. The bench matchup should also be an interesting one. Keep an eye out for Pero Antic. He’s a solid defender and his shooting can force rim protectors like DeAndre Jordan to drift out to the three-point line. Although he’s only averaging 17 minutes per game, the Hawks are +117 when he’s on the floor. The last thing to look out for is the rebounding battle. The Clippers and Hawks are two of the worst rebounding teams in the league (third and fifth worst), and whoever wins this battle is going to have a good shot at winning the game. Look… not much needs to be said about this game. And if you watched the playoff series between these two teams last year, you know why. Last year’s Christmas game was a heated one, too. Blake Griffin and Draymond Green were both ejected as the Warriors pulled out the 105-103 win in the waning seconds. These two teams always play each other tough. This game will be no different. Splash Bros vs Lob City. We’re ready!